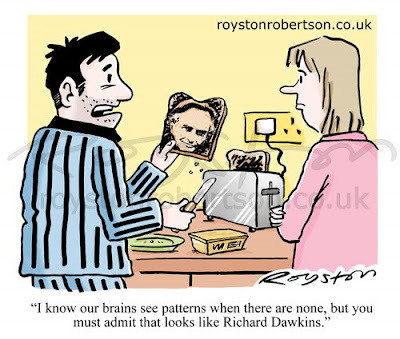 "I know our brains see patterns where there are none, but you must admit that looks like Richard Dawkins." It's nice to know that I can come up with the same joke as the nation's favourite cartoonist (editors take note.) Check out my cartoon from the August issue of Prospect, above, and today's Matt cartoon in the Daily Telegraph. I should point out that I am in no way accusing Matt of plagiarism. Cartoonists often unwittingly come up with jokes that others have done. I've certainly done it. It tends to happen as we're all thinking about similar topical themes and working within the limited parameters of the joke cartoon. Hat tip to my cartoonist pal Wilbur Dawbarn for spotting it. Must be a case of divine inspiration, Royston! Matt's didn't make me laugh, yours did. I think his was a little too straight to the point. Haha. Yours is FAR better, Royston. And contained actual visual evidence of the manifestation. Although they're basically the same joke, the cartoons are for different markets. My version makes the point about brains seeing patterns, which works well as a cartoon for a magazine like Prospect, but would work less well as a newspaper pocket cartoon where more of an "instant hit" is required. Look, I'm not going to ignore the elephant in the room. Matt nicked your idea, Royston. I've got a couple of, er...associates who would be quite happy to go round his house and kick him in the knackers until he blacks out. No mess. Just say the word. It's hardly the elephant in the room, Malc, I addressed the "joke nicking" issue in the blog post! I just can't see it: Matt on a deadline in a busy newspaper office, needs to come up with a Pope Visit cartoon ... so, er, he flicks through a pile of old magazines?